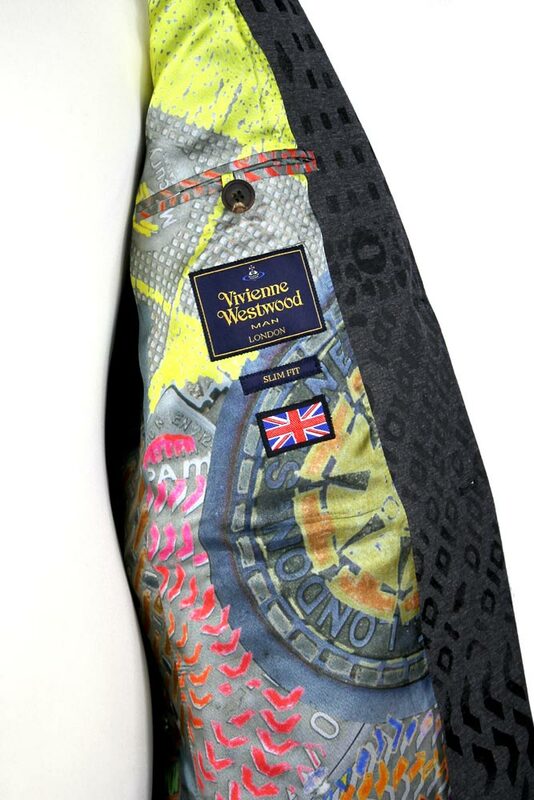 Vivienne Westwood Man London Manning Jacquard, Classic Jacket in grey with jacquard detail writing and designs. Long, slightly curved and pointed lapels. 2 button fastening. 2 pockets with angled flaps and angled left chest pocket. Single vent at rear. Turn-up cuffs with single button fastening. Fully lined in 'Manhole' print. Single inside pocket with button fastening. Slim Fit. Matches the Strap Cuff Classic Trousers in the same fabric to make a beautiful suit.